Let's be honest, my goal in the above shot was to get a close-up of my boy Evan's eye open. But, having freshly awoken from a nap, he refused to shake off his squinty-eyed expression. As we all know, the eyes are a very significant part of any animal's body. It's important to pay close attention to your furbabies' eyes on a daily basis, as not only are they susceptible to disease themselves, but they can also indicate if an animal is ailing elsewhere in the body. Along with posture, an animal's eyes can give clues as to if the animal is in any pain or discomfort throughout his or her body, such as with dilated pupils, squinting, or elevation of the third eye lids. Those can also be signs of disease in the eye itself, as can redness, swelling, discharge, color change, and any other abnormal observations. Given the importance of the eyes, and given their link and proximity to the brain, consult your fubabies' veterinarian if you see any abnormalities or have any concerns. Here we are again, with our selfies for the Sunday Selfie blog hop, hosted by The Cat on My Head! All of my furbabies decided to go for something just a little different today. Astrid wanted to get a nice, detailed shot of her nose. Evan thinks black looks good on him, so he decided to pose in a dark shadow. Like her pup sister, Thimble wanted a close-up shot of her nose, and to show off her big eyes. Eddy decided to show off that she could sit still long enough for some sightseeing out the back door. The furbabies hope you enjoyed their selfies, and we hope you have a wonderful Sunday! Dental month is almost over, but that doesn't mean your furbabies' mouth care should be forgotten. There are a number of things you can do to stay on top of your furbabies' dental health. Look into getting some treats specifically formulated for dental health. Also consider brushing their teeth or other oral cleaning at home. There are a variety of toothpastes specially formulated for dogs and/or cats, and you can even look into getting a product called Maxi/Guard, which can be applied to your dog and/or cat's teeth and gums to promote oral health. And, of course, regular dental checks by their vet are the best way to ensure your furbabies' dental health. 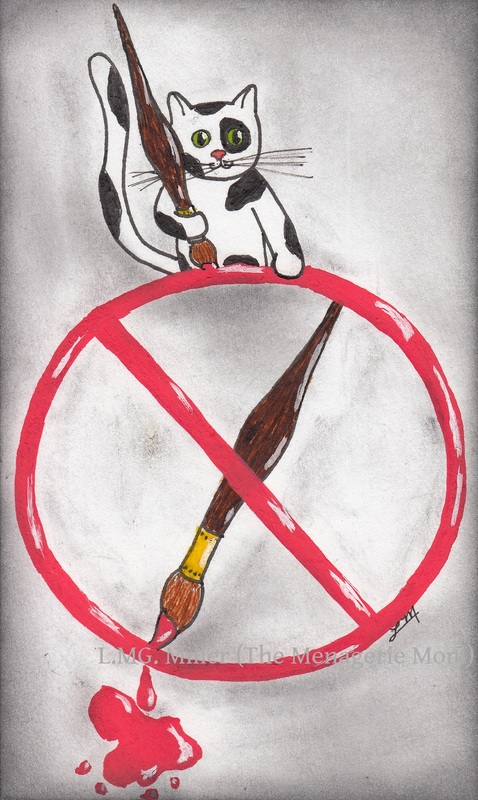 For today's Caturday Art blog hop, hosted by the ever awesome Athena Cat Goddess Wise Kitty, I have finished the next piece in my goofy series starring the furbabies in my life. So far you've seen my angel Rosie as a pirate, my pup Astrid as Dogzilla, my mancat Evan as a mermaid (aka, mercat), my little lady cat Thimble as RoboKitty, and my active kitty Eddy illustrated in all of her wall-climbing glory (if you'd like to see all of these as well as more my art, just click here). So, who's up next in this series? That would be our housemate (and Thimble's biological brother) Toby! We hope everybuddy has a lovely Caturday! Are you tired of cleaning tips yet? If possible, comb your furbabies outdoors, or in a room of your house where loose fur can be easily contained and swept up. This helps to keep excess pet fur and dander from traveling throughout your house, and can therefore help to maintain a fresh a clean home. Eddy and Evan working together to hold my legs down. But then a certain someone showed up and everyone else had to move aside. Another cleaning tip, perhaps? When cleaning your floors, consider using a mop with a removable mop head that is either disposable or washable. That way, you can use a fresh a mop head each time, so that you're not cleaning your floors with old dirt and grime. Thimble Thursday: What's all this white stuff? If you've been reading some of our recent posts, you might remember us mentioning having lots and lots of sun lately, and even temperatures warm enough to open our windows. It's been so nice, and it's given Thimble a chance to catch up on her sunbathing. Well, that's no more. Now, Thimble wants to know, what's all this white stuff? The answer, Thimble, is snow. Remember the stuff we thought we'd seen the last of for a while? Well, it's back. Thimble is not impressed with you, Mother Nature. We indeed had ourselves just a tad bit of a snowstorm yesterday. The good news? I got off work early and got to spend most of the day with my furbabies! Well, we hope you all have a lovely Thursday! And we hope you're all staying warm and cozy, and steering clear of all this white stuff! To help keep your cats and dogs warm, consider getting them thermal, self-heating pet beds. These kinds of pet beds help to keep the animal warm by reflecting their own body heat back to them. This is far safer and more cost effective than.using electric heat blankets. Especially consider trying these for your senior pets, such as those with arthritis. 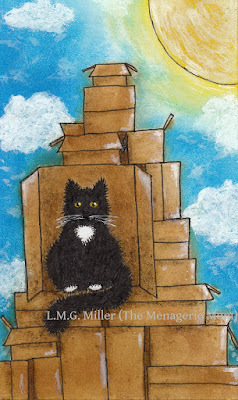 Last week's Wordless Wednesday post offered some snapshots from Tank Topper, starring Thimble. This week, you get to see a preview of the sequel, Tank Topper II, starring Eddy. How about another cleaning tip today? When it comes to cleaning up after your furbabies and doing their laundry, don't forget about their toys. Their toys see a lot of action, being thrown across the floor, slobbered on, landing in a food dish or two, getting soaked in the water bowl, and sometimes even being taken outside to romp around in the dirt. So, to help eliminate dirt and odors in your home, be sure to clean your furbabies' toys regularly. Launder those that can be put through the wash, and scrub down those that are made of plastic or other similar material. We've been getting so much sun lately, even Astrid's toesies have been basking in it. Another shot of Evan in his pink bed, this time starring his toesies. This isn't as scary as it looks. Wolverine Thimble is just doing some kneading here, making some delicious biscuits and all that good stuff. Our housemate Toby wanted to show off his toesies in all of their fuzzy glory. I call these his mittens. I'll be the first to admit that this picture sort of looks a bit concerning at first glance. Keep in mind, though, that this little lady came to me as a special needs kitten, with a head tilt and right-sided facial nerve paralysis. She still has both, and the facial nerve paralysis means that her lip often puckers, leaving her cute little teeth exposed, and this is especially the case when Eddy is relaxed and happy. That being said, the above picture was quickly snapped during a snuggle session. Walks, potty breaks, and any and all contact with concrete and the outdoor elements can leave your dog's paw pads less than soft and smooth. If your dog's paw pads are dry and/or cracked, though, it's not necessarily advisable to apply human lotion to them, as this could possibly soften the paw pads too much and thereby lead to more damage. However, it is important to moisturize your dog's paw pads if they are showing signs of dryness and cracking. In some cases, a little petroleum jelly may do the trick. But, there are also moisturizers specifically created for dogs and their paw pads. Many veterinary offices, pet stores, and online vendors carry such products. Of course, if you're concerned about your dog's paw pads and how to moisturize them, be sure to consult your veterinarian. We're wishing everybuddy a happy Monday! We hope your week starts off great! Although it's advisable to administer flea prevention to your furbabies year round, it's especially important to do so when the weather is warm. Fleas are especially prevalent in warmer temperatures, and, although you may not see them, they often hide out in all that green grass, just waiting for a warm body to hitch a ride on. What's more, not only are flea bites capable of producing flea allergy dermatitis, but they can also transfer tapeworm as well as a number of diseases to their host. So, especially as daily temperatures start to rise, please be sure to give your pets flea prevention. Even the indoor animals should receive it, as fleas can easily come in to the home on us humans or on any household animals that do go outside. Prevention is key! 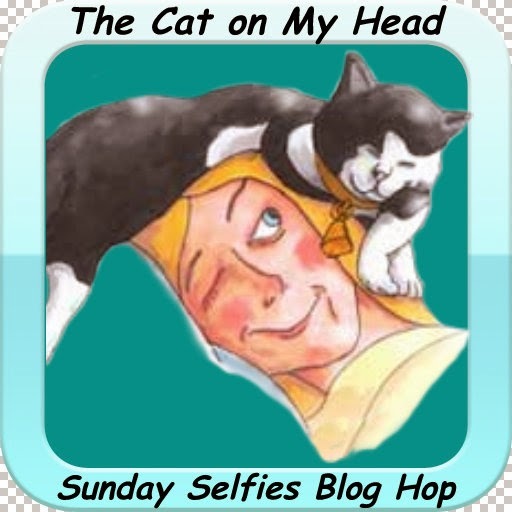 For today's Sunday Selfie blog hop, hosted by our friends over at The Cat on My Head, my furbabies wanted to show off some selfies that demonstrate what beautiful weather we're having this weekend. My alarm clock named Thimble woke me up shortly after sunrise. She was basking in a lovely sun puddle, and demanding breakfast. The beautiful morning sun created such warm and cozy sun puddles, that even active little Eddy was willing to settle in one and actually pose for a selfie. Why? Because when the beautiful sun hits all of the reflective surfaces in the house, it makes for lots of light shows on the walls and ceilings. And, my boy Evan is a light chaser. So, with this selfie of his, he wanted to show off how well he can track lights on the ceiling. And, on such a beautiful day with lots of sun and fresh air to bask in, even our housemate Toby was sort of willing to snap a selfie. I'll just ignore the stink eye and pretend he enjoyed the photo shoot. Happy Sunday, everybuddy! We hope you're all having as beautiful of a weekend as we are! We all want our house to smell fresh and clean, But, we all also know that with furbabies sometimes that's not as easy as it sounds, and oftentimes our homes have that characteristic pet smell. Well, one of the first steps to keeping your house clean and fresh with animals is to simply groom your furbabies, and do it regularly. Combing your cat, dog, or other furry critter removes their loose fur and dander, and those are two of the things that can otherwise end up scattered throughout the house, contributing to that pet smell we all know so well. So, for both the cleanliness of your home as well as for the comfort and sake of your furbabies, be sure to groom them regularly. Caturday Art: It's a (maybe) birthday bash! I'll preface this Caturday Art post by announcing that today is someone's birthday! Well, it's actually what we like to call a "maybe birthday", since we can only guess as to what day she was actually born. But that's beside the point. The only pup in this cat-heavy family is (maybe) turning three years old today! My sister and I brought Astrid home with us on July 20, 2013, when she was roughly five months old. (See what we did there? July 20th, take away five months, and that yields February 20th!) Since that day in July of 2013, Astrid has blossomed into a thoroughly larger-than-life pooch, grown from 30 to 65 lbs, gained numerous feline siblings and friends, and brought some serious spark into our lives. At three years old now, I'm sure this young lady will continue to spice up our lives each and every day, and we wouldn't have it any other way. Happy birthday, Astrid! We love you and all of your wild quirks! Great. Now, where's the cake? 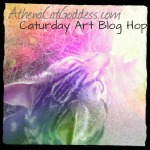 So, that brings me to what I've created for today's Caturday Art blog hop, hosted by none other than Athena Cat Goddess Wise Kitty. This one's for you, birthday girl! Have a lovely weekend, furiends! Did you know that there are chocolate dog treats on the market? Chocolate that we humans consume is poisonous to dogs. Nevertheless, dogs tend to have a sweet tooth and often crave it. The good news, though, is that there are numerous chocolate-like dog treats on the market, many of which use carob as a sweet yet safe substitute for chocolate. 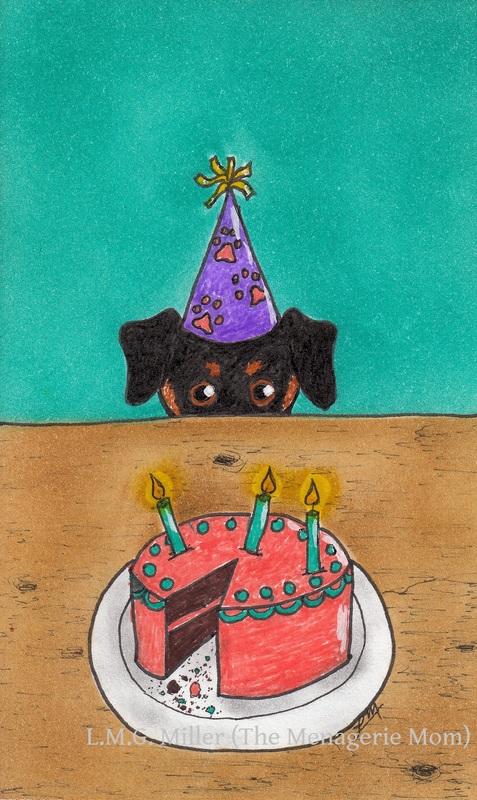 So, if you want to give your pup something special, such as for his or her birthday, try some of the chocolate (but not really chocolate) dog treats available on the market. Way back in early February, Ellen and her adorable crew over at 15andmeowing received the One Lovely Blog Award. And yesterday, Annie and Pierrot over at Annie's House announced that they also earned it. Two very deserving blogs, if you ask me! 1. Thank the person who nominated you and link their blog in the post. 2. 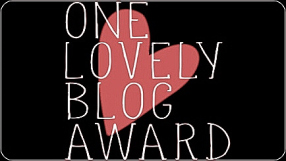 Copy the rules and add the blog award badge as an image. 3. Share 7 facts about yourself to your fellow bloggers. 4. Then nominate up to 15 people. Thank you for this, Ellen and Annie and Pierrot! I love that this award encourages us to share a little bit about ourselves. I always love learning more about my fellow bloggers, and I immensely enjoyed reading the facts that Ellen shared about herself and her cats, and the fun facts that Annie and Pierrot shared about themselves. So, especially since I had such fun learning more about all of them, I decided to take Ellen and Annie and Pierrot up on their offers and to participate in this award by sharing some fun facts with all of you. 1. Angel Rosie's favorite flavor of baby food was ham. In her geriatric years, we administered most of her oral medications by hiding them in baby food, and she was almost certain to get every last bit if they were given in ham baby food. 2. Astrid's tail didn't have its characteristic curl when my sister and I first rescued her. She kept her tail straight for weeks, and then one day she just decided to reveal that her tail is in fact curly! 4. Thimble loves to look at her own reflection. She'll jump onto the bathroom counter and perch herself in front of the mirror there for long periods of time. And she'll also get on top of the fish tank just to gaze at herself in the mirror hanging on the wall behind the tank. She's also not above staring at reflections of herself in glass doors and windows. 6. Although I love to draw and muddle my way through all sorts of arts and crafts, I despise painting. This probably has something to do with the fact that I'm terrible at it. 7. 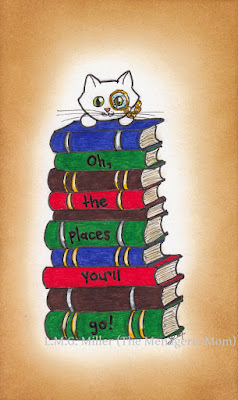 I love to read, and my favorite book genre is fantasy. Of course, fantasy with cute animal characters is the best of the best! Like Ellen and Annie and Pierrot, I want to invite anyone who would like to participate in this award to please do so. Or, even if you just want to share some fun facts about yourselves with us, please do! I know I'm not the only one who loves learning more about you fellow bloggers out there. Happy Friday! 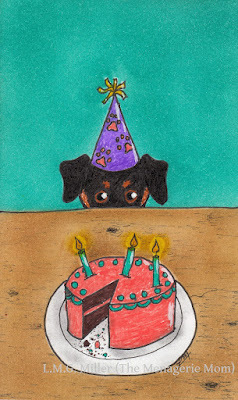 And, of course, a very happy birthday to Mo over at the Cat Blogosphere! Although it's a popular game to play, be cautious and cognizant when using a laser light as a toy for your furbaby, and I don't just mean because of possible damage to the eyes. It is true that both dogs and cats may indeed enjoy playing with the laser light, but also keep in mind that playing with something yet not being able to feel the accomplishment of actually catching it can ultimately frustrate your furbaby. As predators, cats and dogs instinctively feel a desire to catch their prey, and if it (the laser light, in this case) always ultimately vanishes and evades capture, that can become quite discouraging for the animal. If your cat or dog seems to genuinely enjoy playing with the laser light, perhaps consider doing this for short amounts of time, and then end the game by throwing some treats where the laser light is last seen so that your furbaby can feel as if they did indeed catch a reward. Or, try a different yet similar game, such as using a wand toy with your cat or a simple ball or frisbee with your dog. 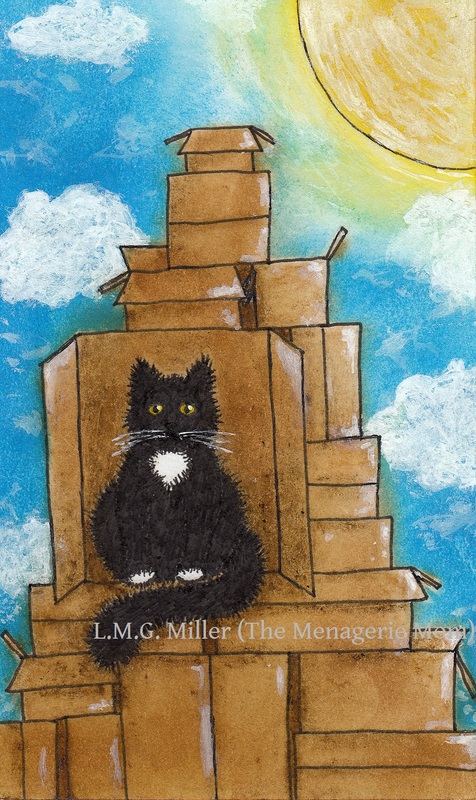 Although Thimble starred in yesterday's Wordless Wednesday post, she still wanted her very own Thimble Thursday post today. As always, she gets her way. Today, Thimble wants to show off a couple of her profile pictures. No, Thimble doesn't have a Facebook page. Rather, her profile pics are the kind that result from her refusal to look at the camera. But, since I'm sort of in love with her adorable profile, that's okay with me. In a pinch, there are a number of cheap and easy household items that can be used as or made into cat toys. Just a few examples of such cat toys include crumpled up pieces of paper, lids from milk jugs or water bottles (or any other similarly sized lid), hair ties, and rolled up socks (stuff some catnip inside for a little extra punch!). Of course, though, as with any new toy, keep an eye on your kitty to make sure that he or she plays safely with any item you offer during playtime. Many cats can build up energy or get overstimulated during petting sessions. This explains why some kitties will seem to be enjoying a petting, and then will suddenly attack your hand. So, if you're petting your cat and start to notice his or her tail flicking or back twitching, those are signs that kitty has become overstimulated and may no longer be enjoying the petting session. If you start seeing such signs, or if your cat is starting to pull away from you, it would be advisable to end the petting session and give your kitty some space. Sometimes, I can get a halfway decent shot of Eddy. And then there's the other 99.9% of the time. Happy Tuesday! We hope all of our furiends out there are having as much this week as Eddy is! How about a couple more tips on feeding feral and stray cats outdoors? If possible, set up a feeding station so that the feral and stray cats always know where to go for food. Also, try to set a feeding schedule or a routine, so that the cats know when to expect food, and therefore when to expend the energy to go in search of this food. This is especially important in the winter, when outdoor cats needs to conserve as much energy as possible on staying warm and safe. In terms of type of food to feed, dry food is probably the best way to go when feeding feral or stray cats outdoors, especially in winter. Canned moist food is largely composed of water, which means cats won’t be getting as many calories from it as they would from a serving of dry food. What’s more, moist food will freeze in the cold, making it inaccessible to any cats who come by in search of food. Of course, offering anything you can to outdoor cats is better than nothing, but, if possible, dry food at a consistent feeding station and on a consistent schedule is perhaps ideal. Sunrise Sunday Selfies, and then some. Thimble Thursday: My, what big eyes you have.